Nick’s Cove is one of the last remaining historic settlements catering to the early California tourist trade on the beautiful Tomales Bay coastland. 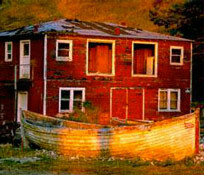 It’s served as a depot for tourism, local fishermen and agricultural operations throughout its history. The property was originally part of a vast ranch until Henry W. Hallock, President Lincoln’s chief of staff during the Civil War, bought the property in 1850 and then sold it to Jeremiah Blake, an easterner who settled on Tomales Bay at a place that became known as Blake’s Landing. During that time, the property was the site of industries as diverse as saddle making, duck raising and dairy farming. The North Pacific Coast Railroad constructed tracks along the shorefront in 1873, spanning the region from Sausalito to the Russian River, transporting passengers and freight, such as dairy products, fish and clams. But it was the construction of a modern highway in 1930, followed by the opening of the Golden Gate Bridge in 1937, that brought a surge in tourist traffic looking for food, lodging and adventure. Marin County became a popular destination for weekend motorists, and Tomales Bay was an especially popular choice because of its excellent fishing. 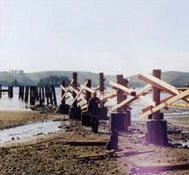 The similiarity of Tomales Bay to the Adriatic Sea, with its mild winters and shallow waters, made the location a prime spot for a large Yugoslavian immigrant community. The Nick Kojich family, the original owners of Nick’s Cove, came from that Yugoslavian tradition. They built several houses atop wooden pilings near the beach, and opened a seafood restaurant selling shrimp and crab cocktails to passing tourists. Once prohibition ended in 1933, Mr. Kojich (a rumored bootlegger) began serving alcohol too. 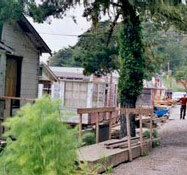 The Kojich’s rented their water’s edge cabins to people from the San Francisco Bay area, Sacramento Valley and beyond. Tomales Bay was a favorite spot for weekend fishermen and hunters, and the Kojich’s catered to those seasonal attractions. The Kojich family remained at Nick’s Cove until their eventual retirement, when Nick’s nephew Andrew, and his wife, Dorothy, took over ownership. Andrew Matkovich was a son of bay pioneer Gregory Matkovich and had actually been born in one of the rental cabins. Although the original restaurant burned down on the year they acquired it, the Matkovich’s rebuilt it from scratch with a full menu, specializing in local seafood. The Nick’s Cove cabins continued to flourish during the 1950s and 1960s, and became a hub for recreational fishing. The Matkovich’s hosted an annual Stingray Derby and a Shark Derby, and held traditional events such as clam digs and crab feeds. Visitors would often tie up at the pier for a meal at the restaurant, and many fishing boats would sell directly to the restaurant, which determined the evening’s menu. In 1973, the widow Dorothy Matkovich sold Nick’s Cove to Alfred and Ruth Gibson, ending more than 40 years of family ownership. The Gibson’s ran the business on very similar lines, and continued to attract hunters, fishermen, nature lovers and unsuspecting travelers who stumbled upon a restaurant/motel full of character and scenic beauty. Guests included university professors, writers, sportsmen, kayakers, and a private pilot who rented one of the cabins every time he flew into the Bay Area. Under the Gibsons, the popularity of Nick’s Cove continued to grow, and further improvements were made to the property. After Al Gibson’s death, Ruth Gibson continued to operate the restaurant and rental business until maintaining the property proved too costly. The current owners of Nick’s Cove have taken special care to maintain the integrity of its traditional architecture in recognition of the cottages’ historical importance. These cabins reflects the coastal vernacular style common to the community, and they have been carefully preserved, while improving their decor to accommodate modern amenities, without damaging their historical qualities.